Read here how ACS Motion Control solutions benefit from EtherCAT integration. 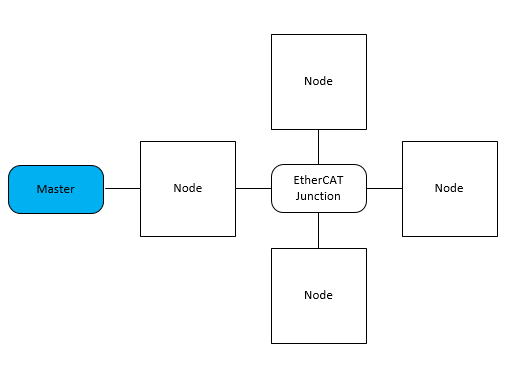 An EtherCAT network includes one EtherCAT Master and one or more EtherCAT nodes. One network can include a maximum of 65,535 nodes. Its exceptional performance, flexible topology, simple integration, and robustness explain why more and more companies decide to develop EtherCAT-based products. Since EtherCAT introduction in April 2003, more than 4500 companies around the world have developed EtherCAT-based products and related software. What Network Topology Is Supported by ACS? Line, ring, and star topologies are supported. Ring topology NetworkBoost™ is a feature that increases system uptime and productivity by network failure detection and recovery (NetworkBoost Application Note). The star topology, based on EtherCAT junctions, might be beneficial when using the Flexible Configuration feature which enables disconnecting groups of nodes during machine operation (Application Note). Synchronization: What Cycle Times Can Be Achieved? In high performance applications exact synchronization is a critical factor. 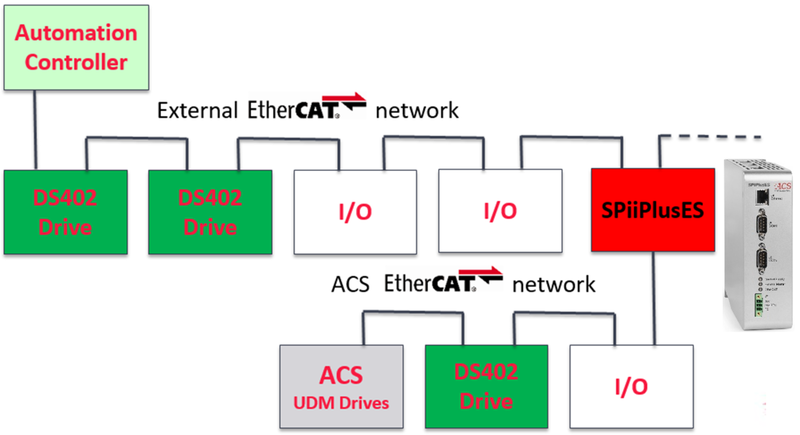 ACS nodes are synchronized applying the EtherCAT Distributed Clocks (DC) mechanism. The controller supports short cycle times: 1ms, 0.5ms, 0.25ms and 0.2ms (1, 2, 4 and 5 kHz). Non-ACS DS402 Drives and other types of EtherCAT nodes are commonly used with ACS controllers. The integration with other ACS products in the same EtherCAT network is easy and does not require any special adjustments. Can ACS Be Integrated as a Motion Subsystem Controlled by Non-ACS EtherCAT Master? The SPiiPlusES, a newly released product, can be controlled by a non-ACS EtherCAT Master and can be easily integrated into a non-ACS EtherCAT network. The SPiiPlusES is first of all a motion controller that controls an ACS “internal” network. As an EtherCAT drive, it supports up to 8 axes according to DS402 standard. In addition, it can be used as EtherCAT Bridge, providing the functionality of synchronized data exchange between the non-ACS and ACS networks. This allows to benefit from the unique ACS control algorithms within the existing network: for example, ServoBoost can be used to optimize step-and-settle times, and NanoPWM allows for tracking with subnanometer precision. ACS Motion Control is a global company providing EtherCAT® based high performance machine control systems for motion centric applications at distributed architecture. ACS develops EtherCAT controllers and a variety of EtherCAT nodes, such as Drives, Digital I/O, Analog I/O, DS402 Drives and more. In addition, ACS develops all complementary software tools such as EtherCAT configurator and network diagnostics. Together with PI, ACS provides Motion Centric Solutions for Industrial Automation such as those in assembly, semiconductor manufacturing, mechanical engineering, laser material processing, inspection systems or in additive manufacturing. 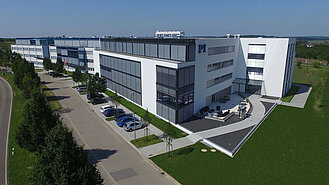 In addition to ACS networks, PI uses EtherCAT to connect their 6-axis parallel-kinematic hexapods to automation tasks. This reduces integration effort on the customer side. Positions are simply commanded positions in Cartesian coordinates, and the stable, virtual pivot point can be defined freely in space. Whether tool or work coordinate systems are used, the PI EtherCAT hexapod controller handles all required transformations.